Rowan Williams has no Navy: So let’s just build a Berlin Wall instead? Watching the latest news to come out of Canterbury (I’m leaving for Lambeth on Monday) especially this and this and this – I am reminded of something my Brother the Methodist once said. We were sitting on the couch and I was lamenting the latest news of the Episcopal/Anglican Crisis and going on about it all, waxing lyrical and getting teary and my Brother the Methodist, in his Methodist fashion shakes his head sadly, but with a hint of a smile. Apparently, being a three generation Navy Junior, I was supposed to understand that cryptic remark. So of course I asked him what he meant. One of the things that makes America a powerful country is that we have the ability to blockade. A blockade is any effort to prevent supplies, troops, information, or aid from reaching an opposing force. The ability to blockade is power. America has that power. The Episcopal Church does not. In fact, it was designed that way. We remember that it was not easy to reinstate the Anglican church after the Revolution. Major changes were made to limit the centralized power of the bishops and clerical orders and more responsibility was turned over to the laity, especially in the Commonwealth of Virginia that had been on the frontlines during the war. A great portion of the Anglicans were loyalists to the Crown and to build any semblance of a church with the Prayer Book had to include the principles of liberty just won in that war. We must not forget that, if we are truly interested in the legacy left to us by previous generations, especially in Virginia. The Episcopal Church does not have a way to prevent supplies, troops, information, or aid from reaching those who are resisting or fleeing. Even now, at this late hour, Episcopalians are still fleeing over the borders into safety. The only recourse the Episcopal Church sees it has is to try to use the courts as their Navy. Things have not been going well on that front of late and a court is not a Navy. Now global attention has shifted to the Lambeth Conference in Canterbury and we are seeing attempts to institute a blockade – but one very different from a Naval Blockade. In an ironic twist, what we’ve seen developing over the last few days are attempts to institute a blockade against themselves. And that is a called a Berlin Wall. This morning’s press conference, blogged by Stand Firm’s Matt Kennedy, is a case in point of a lawyer sent out to meet the press to announce the building of a blockade from the inside. The fact remains (as we’ve been reminded over and over again at this particular Lambeth Conference that – for the record – will have no binding legislative authority) that the Lambeth Conference has no Navy. The absence of the ecclesiastical representatives of at least half of the entire Anglican Communion at this Lambeth Conference illustrates that the Archbishop of Canterbury has no Navy. Their absence is a constant reminder that the Lambeth Conference has no Navy. In fact, the greatest illustration that the Anglican Communion has no Navy is GAFCON. So what to do in a crisis of these historic proportions? It’s what many organizations do when they are in crisis, what families do when they are in crisis, what countries do when they are in crisis – they build a Berlin Wall. A Berlin Wall is not a Naval Blockade. 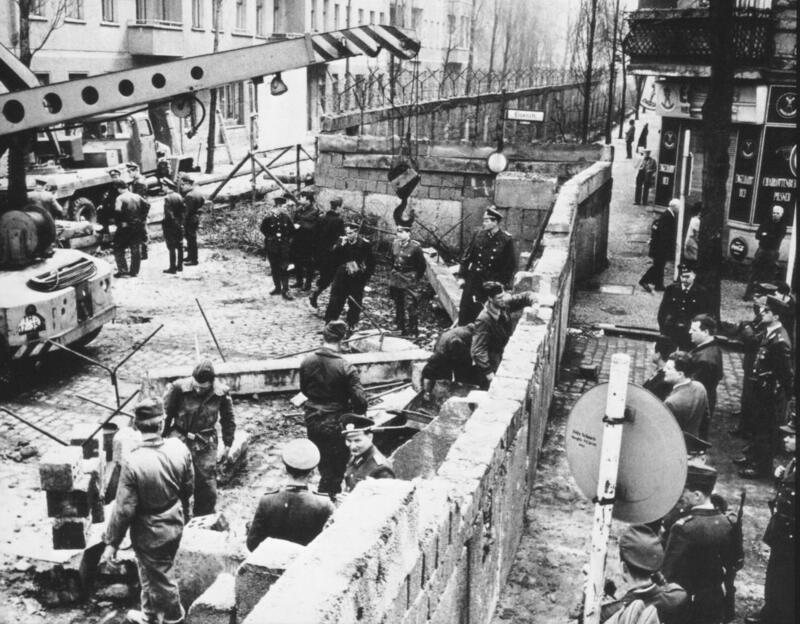 The Berlin Wall was designed to stop East Germans from fleeing. What we see in today’s press conference is an attempt underway at Lambeth to build the Anglican version of the Berlin Wall. It is designed to keep churches and provinces and their assets from fleeing. A scripture that has been very much on my mind and heart over through this crisis has been Galatians 1:1: It is for freedom that Christ has set us free. Stand firm, then, and do not let yourselves be burdened again by a yoke of slavery. A Berlin Wall does not stand for freedom. The lack of transparency, the lack of a free democratic process, the lack of accountability in decision-making, the nearly propaganda-esque event of publicly marching in the streets against poverty followed up by an extravagant palace feast, and now growing evidence of an attempt to control the borders and blockade from within – all point to signs of the building of an Anglican Berlin Wall. Want to see it in action? The lawyer trotted out to the press today stated that he was “certainly affirming that property is held in trust and further on we talk about how that trust involves that property being available from generation to generation and how we must take the long view.” Well, that pretty much sums up the legal strategy of the Episcopal Church right there in their ongoing litigation against the Anglican churches that voted to separate from the Episcopal Church and join another branch of the Anglican Communion. With this press conference this morning, there seems to be mounting and rather compelling evidence that there is an attempt underway to build an Anglican Berlin Wall. In fact, that may be the whole point of this Lambeth Conference – to build that wall. Get ready. This entry was posted in Anglican News, Archbishop of Canterbury, Episcopal News, http://schemas.google.com/blogger/2008/kind#post, Lambeth Conference. Bookmark the permalink. ← Lambeth Update: Is something ticking?